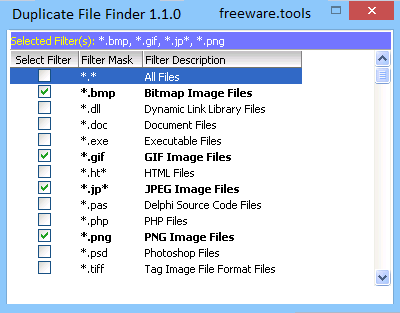 Duplicate File Finder is a tool to find duplicate files. In the main screen of this program you can choose where to look for duplicated files and which extensions you´ll like to search for, or exclude from your scan. You can search by name, file size, file content or any combination of these parameters. You can also set a range of file sizes to look for, entering a minimum and a maximum size. You can choose to look or not into subfolders or into hidden folders, and to include or exclude hidden files. The program will then quickly scan for duplicated files in the selected locations. It will perform the task in three easy to use steps. Duplicate File Finder is a software that will help you get rid of identical files that are stored onto your system. It can easily locate duplicate files on your hard drives, so that you can delete them, in order to free up space. The interface consists of a plain window in which you can easily select folders by using the treeview. Thus, you can fill the path list with multiple directories, configure folder options (e.g. scan hidden files and folders, scan sub folders) and set the file size. You can also select the file comparison method (e.g. contents, size or name only), apply and edit filters (i.e. select particular formats), exclude folders, file masks and folder masks, as well as enable the option to use file dates. In addition, you can save and load search settings files, disable the screen saver from popping up while a task is in progress, view a list of recent files, clear all folders from the list, clear and delete filters, and more. The application uses a very low amount of system resources and finishes a task in a reasonable amount of time. Also, Duplicate File Finder doesn't contain any kind of user documentation. The fact of the matter is that Duplicate File Finder is a very good tool for locating duplicate files on your computer and is strongly recommend it to all users.